Ready to book? Have a look at the prices and availability and find out what other guests think of us under the Reviews tab. You can easily make a booking according to your preferences through the reservation form below. 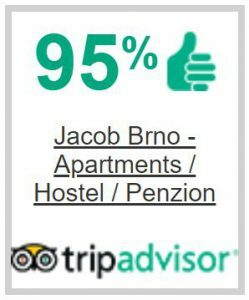 Should you have any questions or requests, do not hesitate to contact us either via e-mail info@jacobbrno.cz or phone +420 542 210 466. Please take a moment and make sure you are aware of our house rules.